Hello, and welcome back. It’s been a while since we talked about Ashes, but now that winter has come and (almost) gone, and Plaid Hat Games has begun to show us glimpses of the Ashes future, the Sniper Troll has woken up from his slumber and is back writing nonsense stuff about the game. I hope to make it up for the long absence. Now, without further ado, let’s get back to work. The purpose of this article is to give a general overview on the various factors and skills that influence the outcome of an Ashes game, which is something that can be extended – with the due adaptations – to almost any competitive 1v1 game. Please note I took a lot of inspiration from The Skills of Netrunner, in the Stimhack blog (thanks to Brendan for pointing it out), so kudos to Elusive for the original article! Random events that are out of the players’ control, which basically mean the order of the cards in both player’s deck after shuffling and the rolling of dice. In almost any game, you’ll see a “skill vs luck” attitude among players: they tend to identify the first category of effects as “skill-based” – i.e. the most skilled player makes the best choices most of the time and wins more – which is usually perceived as a “good ” thing, while the second type is “luck-based”, which is generally considered as a “bad” thing because it removes control out of the players’ hands. Personally, I tend to disagree with this “skill = good, luck = bad” dichotomy: for various reasons I find a certain amount of randomness in a game to be good, since it offers a broader spectrum of players a chance to find an enjoyable way to play the game. How much randomness is to be deemed “acceptable” is – still in my opinion – highly subjective and is not within the scope of this post, so I won’t delve much further into it. What I’m hoping to show you, is that some randomness creates a more interesting game than absolutely no randomness. In the end, let’s be honest about it: we are playing and most likely enjoying a game that involves both drawing cards and rolling dice. Even if you don’t know exactly what it is, there should be at least something good in that, right? Before addressing the various skills Ashes (and by extension, any CCG/LCG/ECG) players need to hone in order to improve their winning chances, let’s talk about some statistical concepts. I know it’s boring stuff, so I’ll try to do my best to keep it to a minimum. When you roll dice or draw cards from a shuffled (non-stacked) deck, the probability of the desired outcome equals to the number of results that provide that outcome (i.e. rolling a given number of power faces, drawing the Molten Gold you need to close the game) divided by all the possible results. Calculating the probability for individual events is usually quite simple: an Ashes die, for instance, shows 1 power, 3 class and 2 basic symbols. Since all the faces showing class symbols are equal to one another and so the basic symbols, when rolling a single die you have a 1/6 probability to get a power symbol, 3/6 to get a class symbol and 2/6 to get a basic. When you roll multiple dice at once, things get a little more complex, but the average distribution of the results remains the same: 1/6 of the dice will show a power face, 3/6 will show a class and 2/6 a basic. The issue here is that this is an average distribution, that is made with the assumption you roll the dice a large number of times – something really far from reality, where you’ll roll at most 6-7 times if the game gets really long. When rolling your 10 dice at the beginning of each round, you are expecting 5 of them to be class on average, but since the roll has a random outcome, you may sometimes get 4, sometimes 6, sometimes none. Knowing average probabilities and expected values alone is good, but not enough: we need something that can give us information about how these probabilities are distributed around their average value, something that estimates the uncertainty associated to the roll, and that is a quantity called variance. Low variance: a higher chance that the outcome of an event falls near its average expected value (i.e. getting exactly 50% of your dice as class symbol). The outcome is easier to predict – low uncertainty. High variance = a higher chance of getting outcomes that are far from the average expected value (i.e. getting all basic or all power dice). The outcome is harder to predict – high uncertainty. Many times you’ll see players complaining about a game being “too random”, or “swingy”. This is the same of saying that the random elements in the game have a high variance / high uncertainty. Can we reduce the uncertainty? The answer is yes. As a rule of thumb, the more repeated random actions you take (i.e. dice rolls or card draws), the lower the relative variance (the ratio between variance and the expected value) becomes, i.e. you have lower and lower probabilities of getting an outcome at the extremes of the distribution. This can be seen as a measure of consistency i.e. the degree of repeatability of a given event. A high consistency is something you’ll most likely want, because implies a higher predictability of your outcomes, and – in the end – more control on the random aspects of the game. So you have these two concepts: variance – the measure of how likely outcomes of a random event that fall far from the expected average are, and consistency, which goes in the opposite direction, that is controlling the outcomes of those random events and reducing the impact of extreme results. We can do little about variance: with both dice to roll and cards to draw, it’s somewhat innate in the game. This means, in other terms, that there will be always a chance of making all the best choices during the match and still lose. Get used to it. It will happen sometimes. But as you might recognize, a single victory or a single defeat doesn’t make you or your deck good or bad: over the course of repeated plays, the most skilled players will always gain an edge. So, if there’s something we can do to improve our chance of winning is to learn to play around variance and improve our consistency, training the four skills I’m going to address below. Does that mean, however, that high variance is always bad, and high consistency is always good? Well… up to a certain degree. As I hope to show you later, relying on high-variance effects can sometimes be helpful. Drawing cards from the deck implies a high variance too: a given card in the deck has an equal probability of being the top one, the one in the middle, the bottom one, or in any other position. Increasing the number of copies of that card and/or drawing more cards at a time increases the number of time the wanted card shows up across repeated games, i.e. increases the deck consistency. Now that we have seen the ways random effects influence the game – through quantities like variance and consistency, let’s take a look at how players can take advantage of this knowledge to drive their decks. 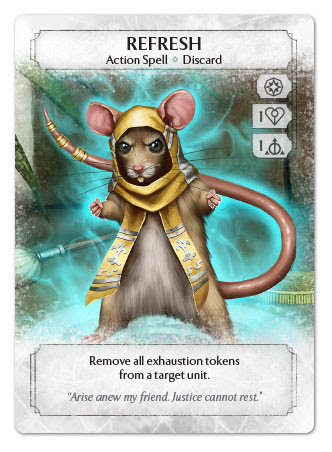 In “The Skills of Netrunner“, Elusive describes four skills that have an influence on gameplay: Efficiency, Strategy, Tactics and Yomi. Since I found his approach and description extremely accurate and useful, I’m going to follow suit, and I’ll try to evaluate what each of these skills mean to an Ashes player, and where and when it can be applied. Ashes is, at its core, a resource management game. Efficiency is a measure of how much advantage we gain from an in-game effect in relation to the amount of resources we used to produce said effect. Board/Battlefield Advantage: having more and/or stronger cards in play than your opponent. It’s not just the numbers, also the quality and the game status of the cards in play matters, thus board advantage changes constantly during the game based on what cards are played and which actions are taken. Resource Advantage: A higher quantity and quality of dice and/or card in hand grants you more options over your opponent, making you more adaptable to various situation, less predictable, and more capable to pull out a stronger threat when you need it. Action/Tempo Advantage: The timing structure of the rounds in Ashes makes it really hard to create sequences of effects without the opponent having something to say about it. Gaining tempo advantage means being able to perform multiple uninterrupted actions, either in the same turn (side + main) or across multiple turns. Better efficiency means either (a) gaining a higher amount of advantage by spending the same resources or (b) spending less resources to gain a comparable advantage. Since the game provides players with multiple kinds of resources (dice, cards, actions, life, battlefield slots – yes, battlefield slots are a resource too), evaluating the efficiency of a card over another can be really difficult. As a rule of thumb, a 1 die = 1 card = 1 life equivalence is usually a good baseline to start with, but outside factors can and most often will mess with this evaluation, as the same card can be extremely efficient in a given situation and extremely inefficient in another. As a player, having a high efficiency means being able to accurately evaluate the cost-to-benefit ratios of the actions at your disposal at any given time, and always performing the most efficient actions. By playing efficiently you’ll reduce variance: you won’t likely make big flashy “do or die” plays, but will gain small advantages one after the other, that will build up over time and inexorably bring you closer to victory. Strategy is the ensemble of meaningful choices that a player makes to achieve his or her goal, i.e. win the game, under conditions of uncertainty (that means, not fully knowing what the player is going to face). As I wrote in my article about deckbuilding, there is a single victory condition in Ashes: having the opponent’s Phoenixborn take as many wounds as their Life before yours do. 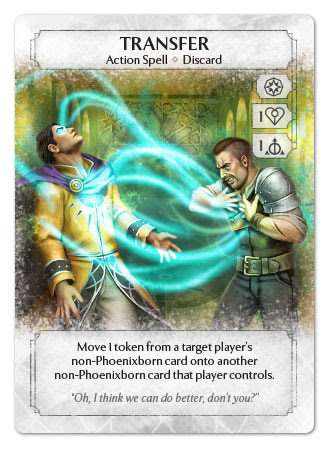 How you intend to achieve this goal is, ultimately, your strategy, and dictates which Phoenixborn you’ll use, which and how many cards you’ll include in your deck, your dice distribution and so on. Basically, strategy covers anything that happens before the actual game, but it is not limited to it. The choice of your First Five, for example, is – at least up to a certain amount – part of your strategy: you’ll most likely include in your deck 2-4 “must have” cards for your initial hand, that will set the course of the game no matter what, and leave the remaining cards as “flex picks” based on the information you gain from seeing your opponent’s Phoenixborn and dice: against Brennen, Choke can get you an edge, while if you faced Coal you would have possibly picked a Summon Dread Wraith to make it harder for him to Slash through your defenses. A strategy can be as simple as “get as many units as I can on the board and hammer through the enemy defenses” or can be extremely complicated, evaluating synergies between cards and combos. As it is affected by unknown factors (i.e. 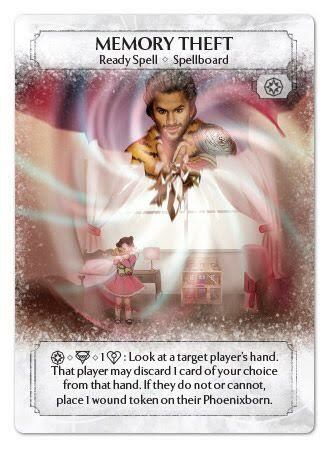 the opponent’s deck), however, having a versatile strategy that takes into account the potential threats that can be posed by the opponent, is usually a good thing as it brings to a reduced variance. Knowing the meta – which deck archetypes are most common in a given play group, which Phoenixborn gets used the most, which cards and so on, will reduce the uncertainty and in the end net you an advantage over your opponents. Though generally, strategy implies a low variance, the choice of cards and dice you make during deckbuilding will have a huge impact on that: if you want to play around Butterfly Monks, Shadow Spirits and Frostback Bears you are already expecting to need a bunch of power dice over the course of the game, which is per se a high variance strategy: you are relying on extreme results on the dice rolling distribution to get your play forward. Now, there are three ways to address this issue. The first one is simple, but most likely not the best option: roll with it. If you get power dice, good, otherwise you lose. Fortunately the game comes with an innate option, accessible to anybody, to fix dice variance: meditation. By sacrificing cards (i.e. long-term efficiency), you are gaining a resource advantage that makes up for the randomness of the die roll. Still, meditating compensates for the high variance but it may cost you a lot of resources, so if you plan to rely on power die a lot, dice fixing cards, like Hidden Power or Shifting Mist can be your best friends in improving your deck consistency. Whereas strategy deals with the achievement of long-term goals, tactics deal with gaining short-term advantages, based on what the opponent is trying to do. Based on what I wrote above, one could think that gaining advantage is the scope of efficiency, but here’s the deal: efficiency only takes into account with what we want to do, and which resources we spend, while tactics deal with the interaction with the opponent’s plans. Sometimes, efficient play and tactical play overlap (which is a really good thing), but sometimes they clash: attacking with my 10-status Silver Snake might win me the game, but the opponent has some charm dice ready: do they have Redirect or Sympathy Pain? From a tactical point of view, scouting at the opponent’s hand with Memory Theft first, though less action-efficient may be a safer option. 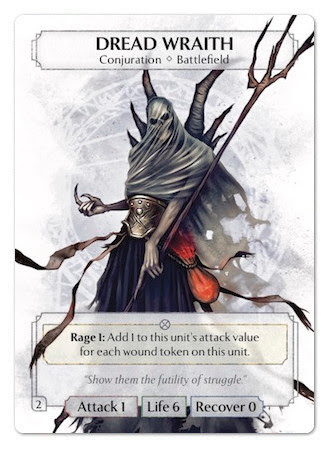 Choosing when to attack, which unit to use and what to target are tactical decisions: sure, your Gilder will deal 1 damage to your opponent, but the opponent has 3 dice and 4 cards in hand: if they play an ally, your exhausted Hammer Knight will have no guard. Is it worthi it to attack? Whereas the first round is usually highly strategic, both player choosing their First Five and setting up their big plan, from round 2 things tend to get more tactical, due to the fact that you can’t choose your hand of cards anymore. Sure, a well-planned deck construction will lead to a more predictable hand, but you are not guaranteed to draw that Sympathy Pain in round 2. And if you happen to draw all 3 copies? What do you do? Will you keep one for the next round? Will you sacrifice some to meditate and get more cards later? In general, the more aggressive a deck is, the more the player tends to think in a tactical way: “what can I do to gain an advantage now?”. You don’t think about getting efficient plays over the course of multiple rounds: you want immediate results: if a move happens to give you a small advantage now and a larger advantage later, the better, but that “later” must be quite close: setting up for an attack in the next turn, playing a Hammer Knight turn 1 and waiting for the opponent’s answer, getting the board clear at the end round 1 to strike unblocked at the beginning of round 2 when we become the First Player token: all these thought belong to the tactical aspect of the game. If you are thinking more than 3-4 moves away, that is already entering the bounds of strategy. Aggressive Meditation can be seen as a tactical play: by sacrificing long-term utility, you can gain power advantage. Sure, it’s a high-variance play: you can end up discarding all your good cards with the same probability as the useless ones, but high variance means higher chances to obtain extreme results: either you fall hard or you win big. In dire situation, where you are going to fall anyway, what do you have to lose? Yomi is the japanese word for “reading” and is used in the fighting game community as “reading the opponent”, i.e. predicting the opponent behavior, and – on a higher level – manipulate their thoughts in order to make them perform the actions you want them to do instead of those that would be better for them. Does it sound like bluffing? If it does, it’s because, basically, they are the same thing. Whenever there is partially hidden information – that is, information that is known to some of the players but it is hidden to others – there is the potential for Yomi. In Ashes, this generally means the cards in your hand and, to a lesser extent – since you don’t have complete information in that case, you know they are there, but not exactly where – in your deck. 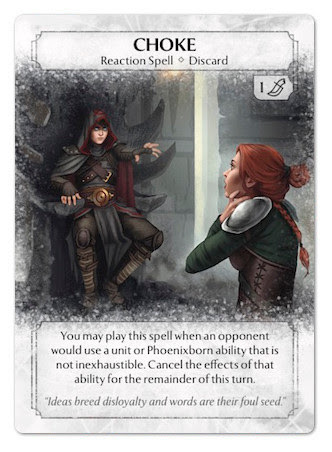 Reaction Spells make the most out of this skill: as your opponent doesn’t know the exact composition of your hand, they can only guess, and assume which cards you can or can’t play based on the dice you have available. 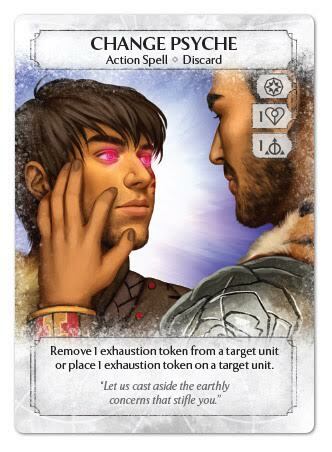 Thus, meditating in order to have a couple of ready in the opponent’s turn, even if you don’t have a Sympathy Pain in hand (or even in your deck!) will lead a savvy opponent to play around the assumption you might have one, and reconsider their choices. Presenting a threat to the opponent and forcing them to answer or suffer consequences, can be seen as part of the Yomi skill as well, especially if you pretend to have a counter-move to their answer while you don’t. Playing cards as a bait for the opponent to waste resources while the real threat is in your hand and only waits the right moment to enter play. Using the Illusion power to remove a key die in the opponent’s active pool so they cannot use a given card unless they spend other resources in meditation… all of these are high-level moves that usually are pulled out by the most skilled players at the right time and look suspiciously like a conjurer’s tricks, don’t you think? But, wait a moment… anyone seeing a pattern here? Yomi can – and most often than not will – be a high variance play: high risk – high reward is the name of the game: prepare to a huge backfire if your opponent can call your bluff or doesn’t care and proceeds to attack anyway. The big deal here is: since you run the risk to fall really hard, you should almost always never bluff when you are in advantage. To wrap everything uo, we have seen how variance can be used as a mean to evaluate the impact of random elements of the game, and – on the other side – consistency gives us a way to improve the predictability of those elements. Neither is inherently good or bad: both can be exploited in various degrees and at various times in the game to gain short time advantage through high risk – high reward moves, and to secure those advantages over a long period through methodical, consistent play. If you see variance and consistency at the opposite end of a “predictability” scale, you can place the four skills I have described here from the most consistent to the least: Efficiency, Strategy, Tactics and Yomi. As players are people, each with their own inclinations and personal preferences, every player will exploit these in different degrees, and will tend to gravitate towards decks and cards that fit their skill set the most. One must not master all of them in order to be good at the game, but should at least hone each one to some degree in order to be successful in the competitive environment. What usually happens during a game is that Strategy (deckbuilding, first five) sets the course and efficiency allows us to follow that course at a constant speed, thus, if nothing intervenes, high-consistency plays will ensure long term success. At this point, higher-variance tactical and yomi plays can change the pace of the game, suddenly allowing the player behind to catch up if they are successful. This implies that if there’s a high skill gap between the players, the most consistent player, the one with better efficiency and strategic skills will most likely win, but when the game is evenly matched, the importance of tactical decisions and yomi plays is enhanced and becomes fundamental. So, next time you feel matches always come down to a lucky top-deck draw in the end, don’t complain the game is too random: it’s a sign you and your opponent are on equal footing. And for now, that’s all. I hope you found something useful in my ramblings. If you liked it, let me know by leaving a comment below. If you didn’t, let me know as well. Soon I’ll get back to the precon deck analysis. 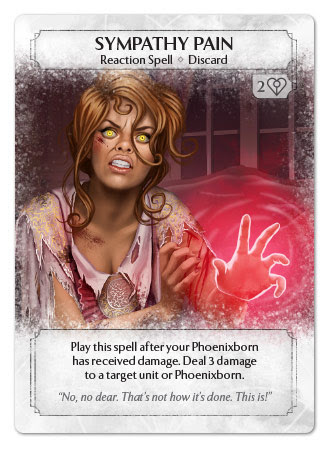 There are still four more Phoenixborn to look at, while we wait for the release of the deluxe expansions.